Lakes and ponds can be a stunning landscape feature but frequently through neglect, lack of maintenance or fly-tipping become an eyesore ruining the water feature. 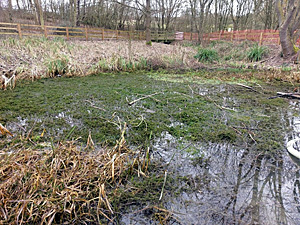 Brambles, brash and self-set saplings can quickly overwhelm the water, requiring extensive clearance before a regime of maintenance can be planned. We offer a full clearance service that can remove debris and litter by either wading into the water using full dry suits or working from boats. In rare cases where the debris is particularly large or heavy we have trained plant operatives who can use machines to assist in the retrieval of the large items from the water. 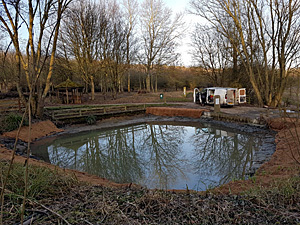 We are also fully equipped to clear brash, bramble and trees from within the lake or pond as well as the surrounding banks to ensure that the lake or pond is kept in great condition and is a safe attractive environment for people and wildlife. A well-maintained pond will reduce the likelihood of bad water quality, silt accumulation, encroachment of marginal vegetation and trees into the pond; this is especially important to provide optimal habitat for essential wildlife species some, of course, are endangered species. We can offer this service as an ad hoc event - reacting to fly tipping perhaps, or as a regular maintenance contract. We are happy to visit the site and offer a quote and recommendations to restore your water feature to meet your objectives and aspirations.